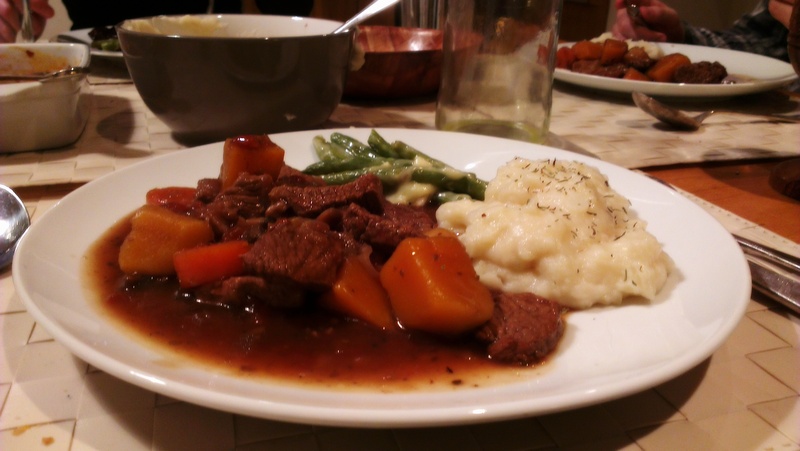 With St. Patrick’s day just around the corner I thought what better than some beautifully boozy Beef and Guinness Stew? Well…technically any Stout Ale will work. This is perhaps one of the easiest, most satisfying meals you can make and SO adaptable. I do mine in the slow cooker for ultimate convenience. 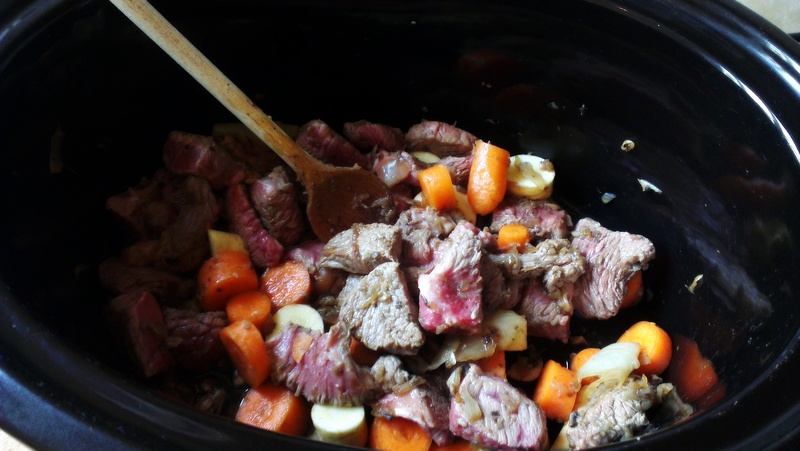 Do up to step _ the night before then leave it all in the slow cooker pot, switched off. In the morning just turn it on to low and when you return 8 hours later dinner is already there and the house will smell lovely! If you don’t have a slow cooker, just do it in a normal saucepan, simmering on a low heat with the lid on for 3 or 4 hours. It’s not the fastest recipe, but it requires next to no effort, so it’s worth it. Remember, the longer you cook this for the more tender the meat will be. Chopped Vegetables – roots, mushrooms, potatoes etc. Chop and fry the onion in the butter. Cut the steak into cubes, coat in flour and add to the pan. Fry just until each piece is sealed and brown then take off the heat. You don’t want the meat to toughen. Add the onion, steak and all other vegetables to your pot. Pour in the Guinness until it nearly covers all of the ingredients, then top up with the chopped tomatoes. Add the herbs then place on a low heat with the lid on. Avoid removing the lid if you can during the cooking process. After you feel enough time has passed and the meat is cooked to your liking, it’s time to thicken. The easiest way to do this is mix a few spoonfuls of cornflour with water in a little dish, then pour into the stew. I normally advise rouxs for thickening but they are best used at the start of the cooking process. When thick enough, taste and adjust. Salt, pepper, more herbs etc. A little sugar couldn’t hurt to offset any bitterness. It’s a stew, you can’t go wrong. Some greens, some potatoes, a bit of bread to mop it up. Make it look pretty with some garnishing herbs. This will keep in a sealed container in the fridge for a few days, or freeze and defrost. 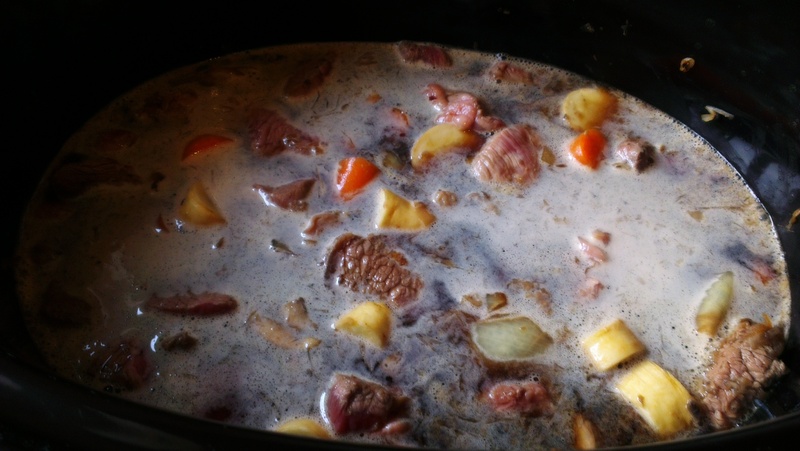 Again – it’s a stew…you’ll live. Happy St. Patrick’s Day, from The Guesscipe Book! 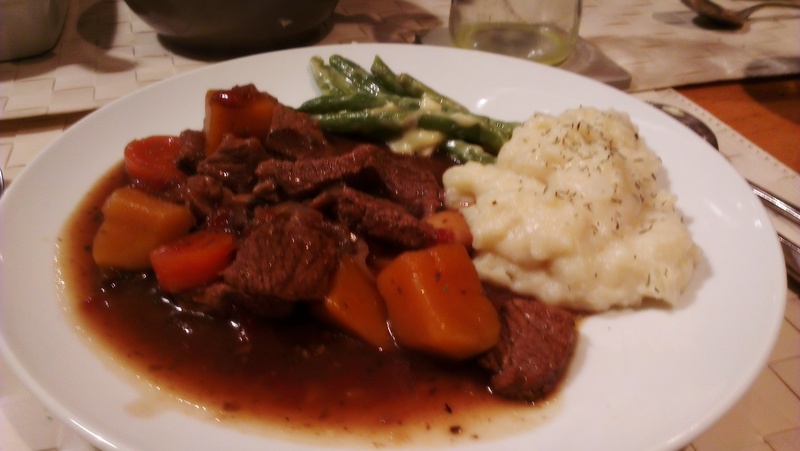 Posted in Beef, Guesscipes, Mains, One PotTagged beef, beer food, casserole, guinness, main, paddy, recipe, simple, st patricks day, stewBookmark the permalink.